Boost your web development skills with our course on jQuery introduction. Our hands-on learning course on jQuery provides you an opportunity to jump up the ladder of web development career. 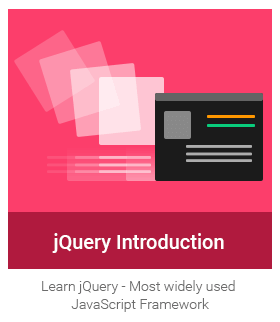 jQuery Introduction gives you an edge to your web development career with five constructive modules. It comes packed with whiteboard videos, interactive quiz, online simulation programs and quick, easy references to events and methods. Write your first jQuery program to print “Hello World” using our online simulator. Also study ‘Selector’ element and action method, commonly used jQuery selectors, document ready event, compact document ready event and selecting elements using id and classname. Here, we learn about events, types of events like page, form, keyboard and mouse, jQuery action events of selector, events, effects and DOM manipulation actions and div.click method. We also study about jQuery effects and its methods like hide, show, toggle, fadeIn, fadeOut, fadeToggle, slideDown, slideUp, slideToggle and parameters speed and callback. Next, we have DOM manipulation methods – text, val, html and attr. Use these methods with get and set. More methods for CSS manipulation – addClass, removeClass, toggleClass and css. Also learn method chaining, event methods like blur, bind, die, delegate, target, focus, trigger etc. , effect methods like animate, finish, stop, queue, stop, slideUp etc. and HTML/CSS methods like append, clone, detach, position, prop, val, unwrap, prepend etc. We study how jQuery and AJAX support works, What is AJAX, load method, parameters – URL, data and callback, get and post methods, parameters – URL, data and callback, jQuery AJAX methods – get, getJSON, param, post, serialize, load, ajaxStop, ajaxSuccess, ajaxError, ajaxPrefilter etc. We end our course with jQuery noConflict method, using $ as a shortcut and jQuery miscellaneous methods like data, each, get, size, toArray, index etc.